Customer Analytics is a pioneer in the field of retail analytics. With more than 25 years of experience working with retail clients, we understand business needs. We also know how to use state-of-the-art analytics techniques to turn transactional and demographic data into valuable insights for retailers, both B2C and B2B. This experience, and the wisdom gained from it, have now been packaged to provide analytics out of the box, through our cloud-based solution ROCKIT BOX™. With ROCKIT BOX, you can get the benefits of analytics without needing to hire an army of data scientists or buying expensive BI and analytics tools. Simply upload your customer and transaction data into ROCKIT BOX to get rich analytical insights and reports! ROCKIT BOX is a package of predefined analytical modules across three dimensions—Store Intelligence, Market Intelligence and Customer Intelligence—to give you a 360° view of your business and operating landscape. What is the market potential for my products? What does my trade area look like? What is my market penetration and where should I focus my sales and marketing efforts? Who is buying/not buying? Who buys Brand X vs Brand Y? Who buys online vs instore? Click here to see more such business questions and how ROCKITBOX helps answer them. While the ROCKIT BOX package provides the core analytics required by a retail business, it can easily be customized to meet the specific need of your business. 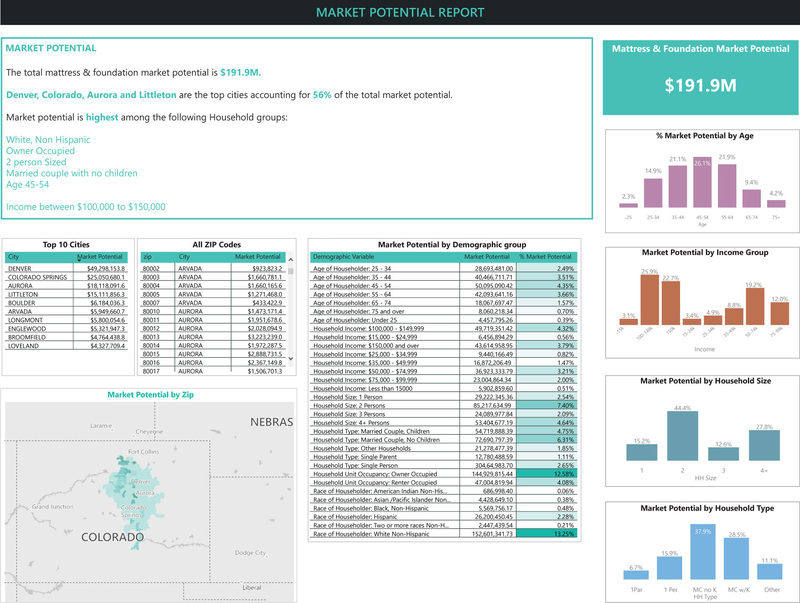 View market potential by geography and demographic attributes. View zips segmented into Grow, Protect, Maintain, Review and Ignore areas based on market potential and penetration. View sites recommended for a new store location, ranked by criteria such as market potential, competition, etc. 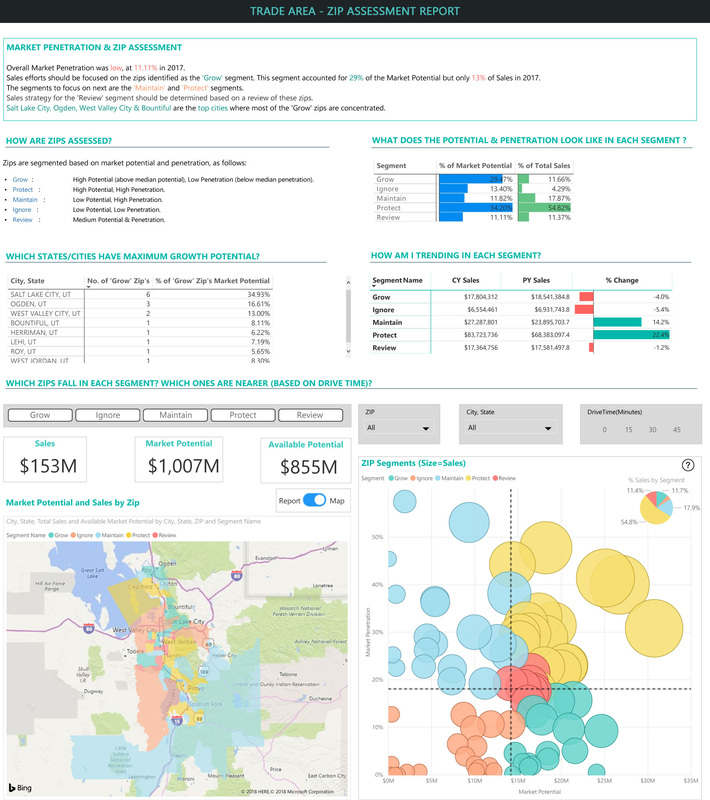 View population estimates by geography and demographic attributes. View KPIs across stores and identify problem areas. View performance trends, what is selling/not selling, top brands, top stores, etc. Understand trade area around a store location to maximize marketing resources and avoid cannibalization. View products that sell most often along with other products, in order to create suitable offerings. 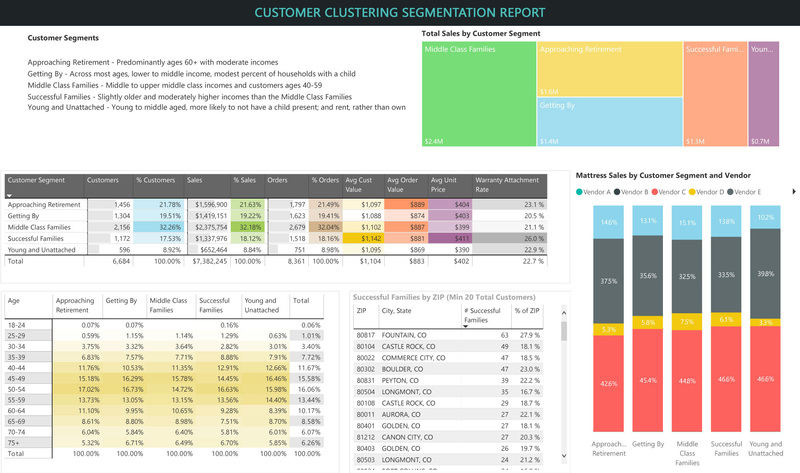 View customer segments based on demographic attributes and understand buying behavior of each segment. Compare characteristics of buying customers by different attributes, e.g., brand. 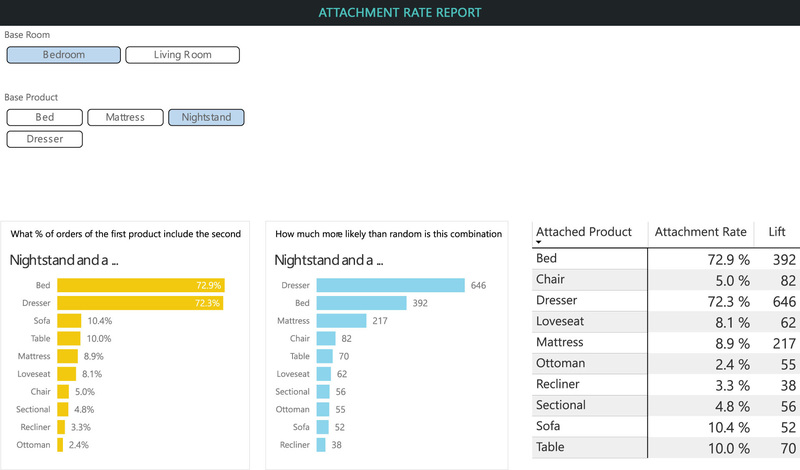 View performance/trends in different purchase behavior based customer segments. Support business operations such as sales team assignments and warehouse location planning. 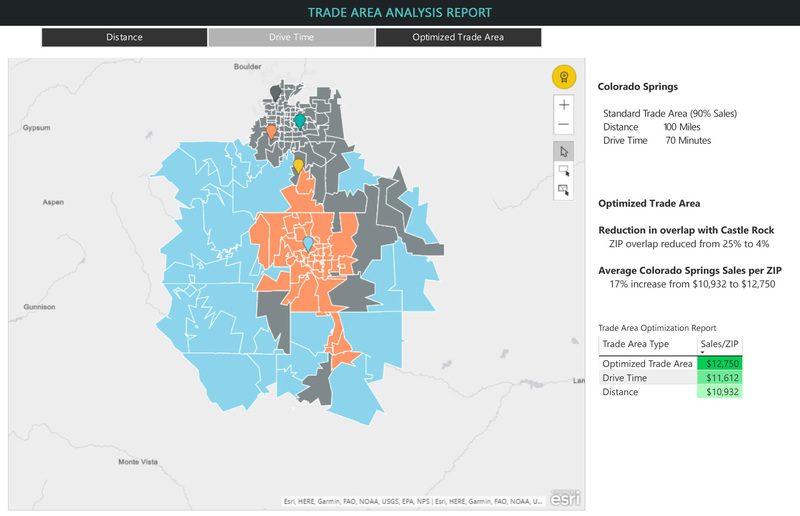 Using spatial analytics, optimize the geographic areas either by size or time to service. Overview and detailed maps with supporting reports that detail the geographic areas included in each region. 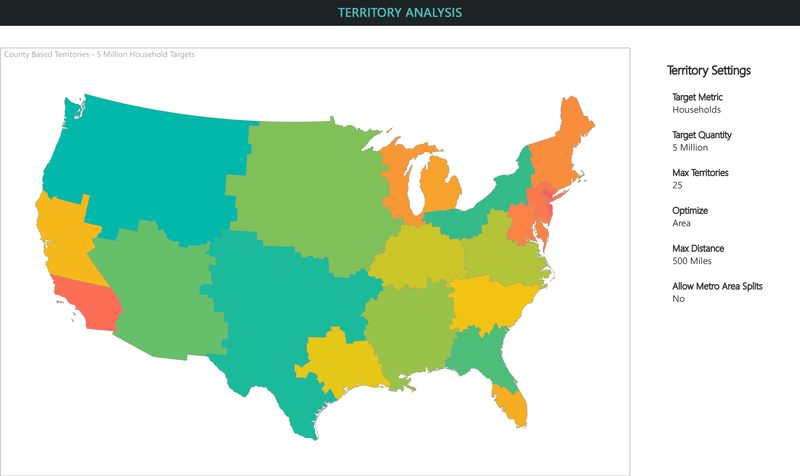 Understand market potential by small area geography and demographics for better targeting. Leveraging traditional demographic and statistical techniques, CA produces small area estimates of population and households using data from reliable external sources. Combined with external data on spending patterns, this is used to create small area market potential estimates. Summary of insights highlighting geographic areas and customer profiles with the highest potential. Detailed view for executive action. 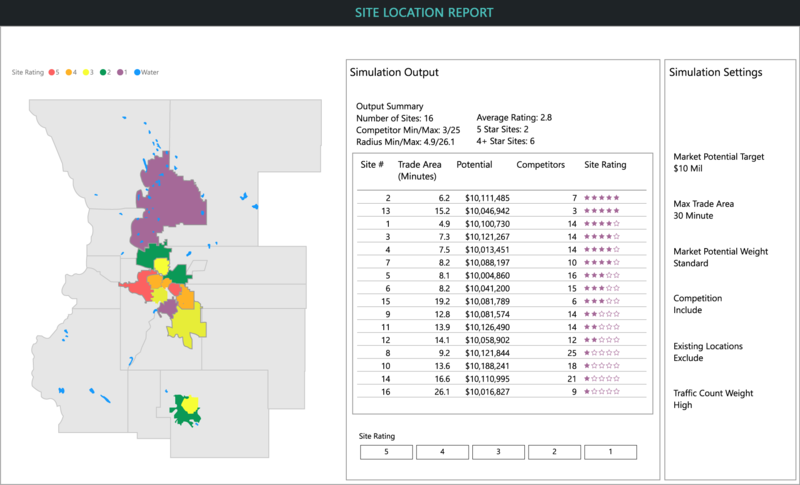 Evaluate geographic areas to identify optimal future store location. Obtain market potential data and identify areas with high potential density. Understand location level demographics, population characteristics, economy and competitive landscape in evaluating new store locations. Consider a wide variety of data sources such as climate, traffic counts, travel time, customer history, social interests, etc. Recommended store locations, with star ratings for easy decision making. Identify growth areas where sales efforts should be concentrated. Identify geographic segments and determine the sales strategy appropriate to each segment. Obtain market potential by ZIP from industry specific market potential data. Use sales by ZIP data from client and market potential data to compute market penetration in each ZIP. Segment ZIP codes based on whether they fall above/below median potential and penetration, e.g., as Grow, Protect, Maintain, etc. Interpreted results with high level insights and summary. Quadrant showing ZIPs colour coded by segment. Bird’s eye view of geographic segments to help determine sales strategy. Detailed view for executive action, e.g., filter ZIPs by drive time for better targeting. Diagnose problems with specific stores. Use store transaction data to compute KPIs by store. Compare these to goals and highlight shortfalls. Compute an overall diagnostic score to highlight stores of concern. Insights highlighting stores requiring attention. A bird’s eye view of individual store performance vs. goals, comparative store performance, and areas of concern in each store that can drive action tailored to addressing these areas. Identify customer groups for better targeting. Process existing customer and transaction data to build a ‘customer master’ with duplicates collapsed and all purchases consolidated against unique customers. Enrich with demographic data appends. Actionable strategic customer groups that can be optimally targeted for marketing. Understand past trends and current health of the customer population based on transactions. Using client’s point-of-sale data, customers are segmented based on their purchase history (recency and frequency of purchase). Revenue and transactional metrics such as acquisition, reactivation, retention rates, dormant customer count, and average order value are computed for each customer segment. Identification of the client’s business model (acquisition, retention or a hybrid model) by grouping customers into segments based on their purchase history. 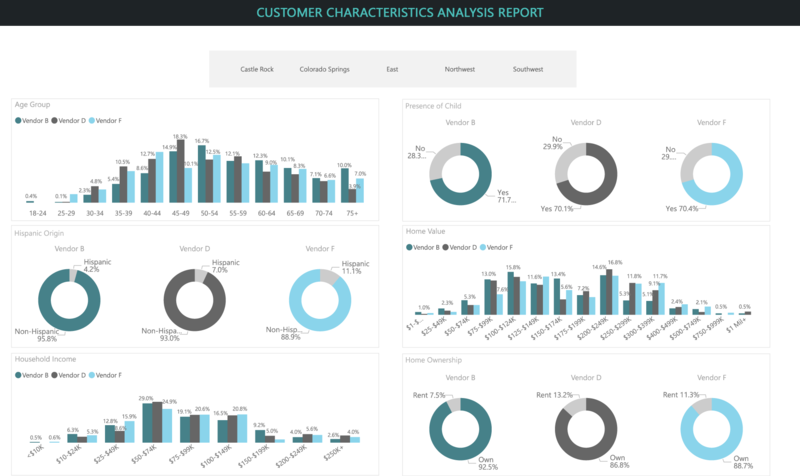 The metrics computed for each segment indicate the health of the customer base. Understand sales performance and trends. Use transaction data to produce sales metrics by various dimensions. High level insights into performance trends: what is selling/not selling, top brands, top stores, etc. 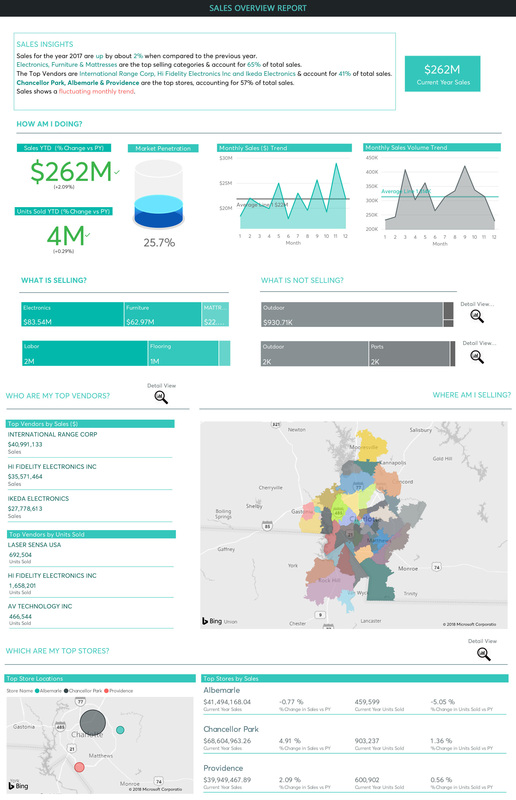 Detailed views to show performance and trends by product category, vendor, store, etc. 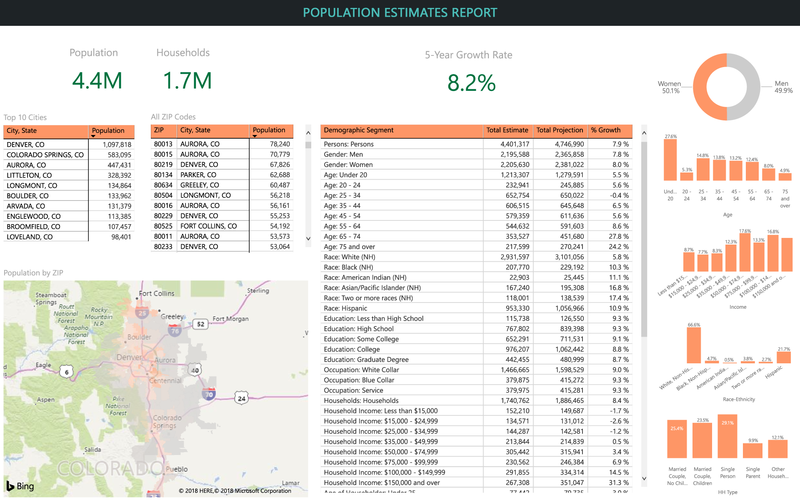 Population and household projections help the user to understand the distribution and composition of local (or national) markets to help drive business decisions. Using demographic and statistical techniques, CA produces small area current-year and 5-year forecasts of population and households from reliable external data sources. Population estimates by geography and demographic attributes, and projected growth. Identify a store’s trade area, where its customers are coming from and its business potential. The store’s customer database is geocoded and plotted on a map; areas are outlined and coded by the size of sales. Octant modeling algorithm computes the trade area boundary, segment by segment, always ensuring minimum customer presence. Zip codes within the octant trade area are optimized for customer density, revenue, and other factors such as transportation corridors and drive time. The most optimal trade areas of a store are plotted on a map after considering highways, water features, and undeveloped areas. Understand what products are most often sold together (their ‘attachment’). For a selected product, determine how frequently every other product is sold along with it. A report that allows users to select a product and view a list of other products sold along with it, as well as their attachment rates. Demographic profile of customers to understand their buying motives and behaviors, and to formulate sales/marketing strategies. Transaction data is used to understand purchase behavior. Demographic append sources are tapped to enrich customer profile. 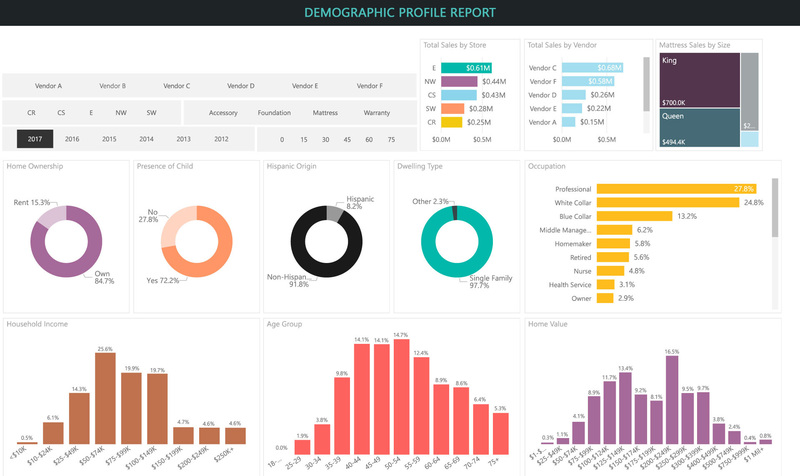 Distributions of customers by demographic attributes to help discover special conditions about customers, opportunities, or new market segments. Which geographic areas and customer profiles have the most potential? What demographic changes should I gear up for? Which are my top stores? How am I doing vs the Industry? What products can be bundled together for higher sales? What does my trade area look like? What is my market penetration and where should I focus my sales and marketing efforts? How are my stores performing? Which ones are problem stores? Where should I open a new store? How would opening a new store impact nearby existing stores? Should I consolidate any existing stores? Who is buying/not buying? Who buys Brand X vs Brand Y? Who buys online vs instore? How many of my customers are returning customers? What segments are likely to return? Compare customer demographics at different levels—for example online vs instore, Brand X vs. Brand Y, customer demographics vs. trade area demographics—to understand current position and opportunity. Using client’s point-of-sale or transaction data, each customer's record is enhanced to include age, income, education, family type, homeownership, longitude and latitude, and other attributes. Customer demographics are then compared to the defined trade area or at other desired levels. Tabular and visual comparisons of customers at different levels, that help identify areas of opportunity.